My Early Sumerian army is finally on the painting table. 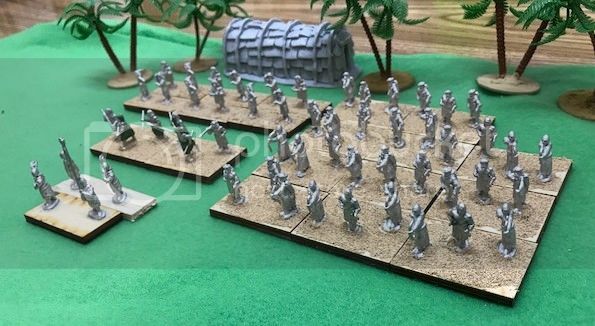 The army has 11 stands of bow levy, two rabble, six skirmishers (slingers), and one stand of raiders representing the general and his best troops. So twenty stands worth 48 points. All the figures are by Eureka. The Eureka rabble figures come in two poses, so I did some conversions to make each one unique. Two of the figures are from Eureka's Mound Builder range with added sheepskin kilts and long hair. I put together some extra scenic items for the table. These include a reed house, a farmer plowing a field, some beer drinkers and friends, a big man, a ram caught in a thicket, a soldier on a straddle car, and an artisan presenting the Standard of Ur to a noble lady. 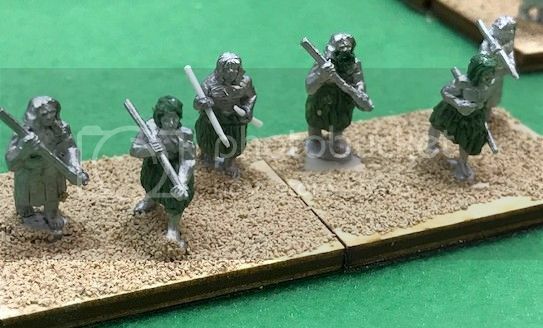 The standard is actually about 200 years after the time period for this army, but I include it here because I plan to expand this army so that it can be used for a Gilgamesh-era Sumerian force. The camp is going to be a section of city wall with additional buttresses added to give it the right Sumerian look. I will post more pictures with additional details as more stands get completed. Where did you get the reed house from? The reed house is from Acheson Creations. It is from their native american or Indian collection, I dont recall the exact terms. I took two grooved wooden dowels from the craft store, wrapped twine around them, shaved down the corners of the building, and super glued them in place. It doesnt look exactly like the Sumerian reed houses seen in art, but is reasonably close. Some painting done, including the basic paint job on the command stand. Thanks for the information. I'll check out their website. Six stands of skirmishers and two rabble now have basic paint jobs. These figures are easy to paint; clean castings with good definition. And almost no equipment. I tried painting the javelins as having reed shafts but I am not quite happy with the effect. Color suggestions are welcome. It took me about 2 hours from start to finish on 18 figures. The next steps will be painting the bow levy, then staining using Minwax Polyshades. I have seen several Sumerian armies with desert/sandy bases, but I plan to do these bases with plenty of green. Six stands of bow levy now have their basic paint job. The completed army and a closeup of the General’s stand. They look great and the pictures are very good too.